It looks like we have a decent chance of hitting 80 or warmer each day through Sunday in Philadelphia, which is an impressive streak of warmth for this time of the year given our average high is not too far from 70 degrees in early October. Given our push of warmth ahead of a cold frontal passage on Sunday into Monday, it's conceivable that Saturday ends up as the warmest of the stretch...some modeling has hinted at the prospect of upper 80's in parts of the region on Saturday. That would not be a record here -- 96 is the record high for Saturday (set in 1941) -- but it's still a rather warm day by the standards of this time of the year. Should we make it through Sunday without missing 80 degrees, this would be the longest streak since 1990 of consecutive days at or above 80. 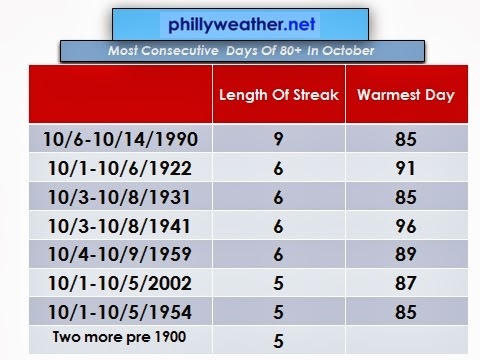 In fact, we've only had nine streaks of five days or longer with 80 or warmer in Philadelphia's recorded weather history, so this warm streak that we're in the midst of...assuming we do indeed hit 80 each day...is a bit of an anomaly. The 1990 streak is the gold standard of warmth duration in October -- nine consecutive days! The last time we had hit four consecutive days was 2007, five consecutive was 2002. We might hit six if we can sneak through tomorrow with 80 or warmer. Clouds will be on the increase and that *may* prevent us from hitting 80 by day's end. It'll be close...if we can make it through tomorrow, we should make it through Sunday and hit a six day streak.